The Budokan has been the site of many historic performances in Rock. Deep Purple’s Made in Japan, Cheep Trick’s At Budokan, Ozzy Osbourne, Eric Clapton, the Doobie Brothers and the list of legendary performances goes on for miles. On February 7, 2017 the soon to be Rock and Roll Hall of Famers, Journey, decided to celebrate the 35th anniversary of Escape by performing not only Escape but also Frontiers cover to cover in front of 14,000 adoring Japanese fans. Neal Schon (guitarist), Jonathan Cain (keyboardist), Ross Valory (bassist), Steve Smith (drummer), and Arnel Pineda (lead vocals) are joined by Travis Thibodaux on keyboards and vocals. Clocking in at just over 2 hours what you experience with this show is something many of us have never seen Journey perform…a track that isn’t certified platinum. It is a bit odd to see the band open with “Don’t Stop Believin'” for certain. Where do you go from there? Well “Stone In Love” certainly is one way. It is most interesting to watch the band interact with each other doing songs they don’t normally do. Instead of being on auto-pilot, which I’m sure they could be for the hits, these guys are making eye-contact, head nods, and the such to end songs and solos. The set is minimal in today’s standards. Just the scarab background and two video screens showing only the band to those in the back. No synchronized video, no pyro, just a band playing classic songs masterfully. There is a massive distance form the band and the front row to allow for video production and filming but Arnel bridges that gap like few can. Tracks like “Who’s Crying Now” showcase the band’s ability to flat out sing. Everyone with the exception of Steve sings at some point in just about every song. Steve Smith’s drumming is a joy to watch. Once could wish for the old days of DVD’s when angles allowed the user to choose what they would. My choice would be to watch the clinic he put on. One thing that made the performance feel more personal was that each member of the band (with the exception of Steve) talked to the crowd and introduced a song. It felt very relaxed. Travis Thibodaux is featured on lead vocals on “Lay It Down”, “After the Fall” and “Frontiers” although only credited as a backing vocalist. He did a very nice job. 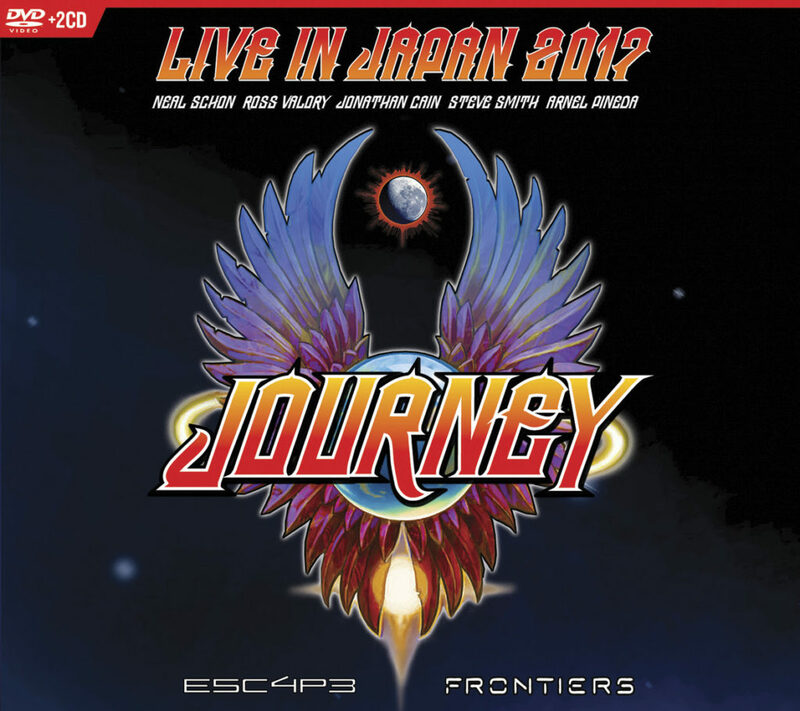 Journey’s Live In Japan 2017: Escape + Frontiers is available March 29th from Eagle Rock Entertainment.